As we mark World Rhino Day 2018 on Saturday 22 September, and contemplate the poaching crisis which has gripped the country for more than a decade, WWF urges South Africans to consider its human cost. Illegal wildlife trade not only harms rhino and other wildlife, it also impacts on people living around the affected parks. Our protected areas are often situated in the midst of poor communities who face major challenges to live dignified and safe lives. Criminal syndicates who drive the illicit horn trade become connected to these vulnerable communities where poaching can be seen as a solution to economic hardship. Yet wildlife trafficking usually only benefits a few whilst causing upsets to the majority of people who make up the community. For example, a recent report titled “Ending wildlife trafficking: local communities as change agents”, authored by researcher Dr Annette Hübschle of the University of Cape Town, describes how a grandmother in a Mozambican village is very concerned about her local society has changed because of rhino poaching. With the influx of money from rhino horn into the village came the abuse of alcohol and the sexual exploitation of women. Rhino poaching is also damaging due to increased stress and pressure placed on rangers and their families. Wisdom Mathebula, wife of the Kruger National Park ranger killed in conflict with poachers in July, remembers the intimidation she felt during an encounter with a man in a taxi prior to his death. “He told me my husband was very troublesome. I could see the ill-feeling he had towards him,” she recalls. After the loss of her husband her son was too scared to go to school. “He was afraid that what killed his father would kill him too”. On top of the emotional strain Wisdom and her family is taking, she fears the financial uncertainty that comes with the loss of a household’s sole breadwinner. To date, increased law enforcement has been the primary response to stop illegal trade in rhino horn. However, many now agree that without community support law enforcement alone will fail to stop the illicit trade. Hübschle sees communities as the most “crucial change agents in conservation and wildlife protection on the supply side”. Law enforcement responses are important, but community support for wildlife conservation is critical. 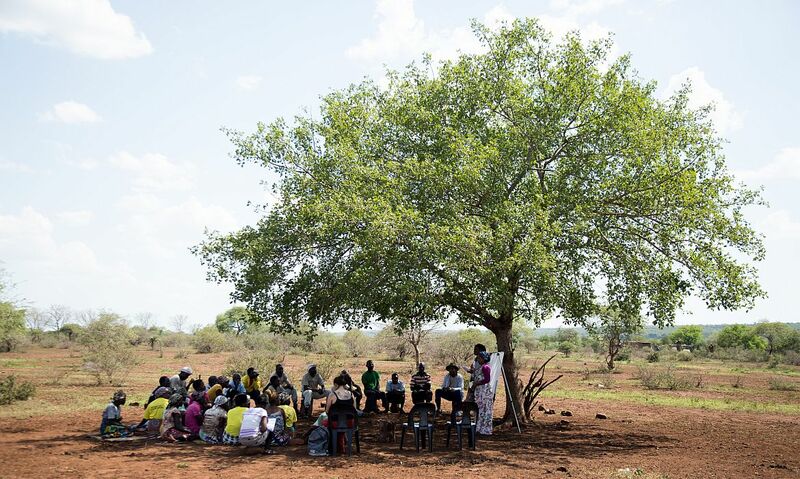 WWF’s Khetha (which means “choice”) Programme in the Great Limpopo Transfrontier Conservation Area is building partnerships between the governments of South Africa and Mozambique, community leadership, and NGOs to address wildlife trafficking. These partnerships include communities in the formulation of strategies, plans and initiatives that aim to address the underlying causes that lead to illegal wildlife trade and improve community beneficiation linked to protected areas and wildlife. Khetha is implemented with support from its development partner, the United States Agency for International Development (USAID). Community engagement with people living close to wildlife is vital.